Recycle Swap Shop shifts quarter of a tonne of stuff! 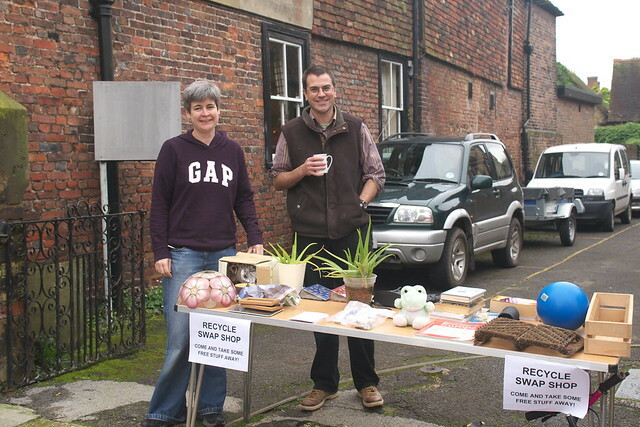 This morning, St Mary’s Ecology and Transition Rye ran the first ever Recycle Swap Shop in Rye! As a result, at least a quarter of a tonne of stuff went to a good home, and didn’t end up in landfill or just cluttering up someone’s house. We had 300 people attend, which was more than we had ever hoped for! We’d like to thank Neighbourhood Enablers for their financial and practical support, making this inaugural event possible. If you’ve never been to a Recycle Swap Shop before, here’s how it works… People turn up during the first half of the morning with stuff they no longer need, and leave it for other people to take. Throughout the whole morning, people can browse the items there to see if there’s anything they would like to take away – at no cost! It’s not required that people bring something to ‘swap’ (despite the name) – in fact we need people who bring nothing but take stuff away, otherwise we have too much left over at the end. For people who had larger items (e.g. 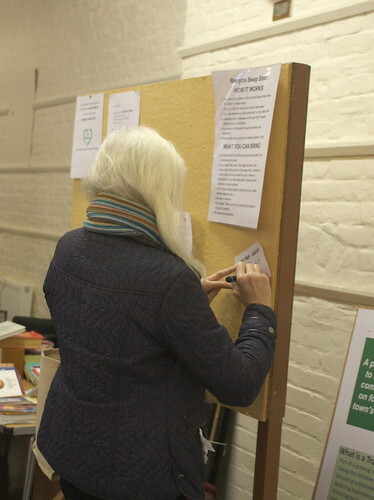 furniture), we asked that they didn’t bring them along, but instead left a note on the noticeboard for people to contact them about collecting the item, or join the local Freegle group if that didn’t work for them. …and they were certainly busy with people asking about how the event worked! It wasn’t just swapping, there was plenty of time for a drink and a chat as well! Most of the leftovers went directly to charity shops in Rye, and the rest was recycled at the tip – we estimate that only less than a tenth of the items that were brought in to the event went into general waste. We hope to minimise this in future by asking people to only bring items that are sufficiently clean/usable/attractive to be taken away by others. Although the event was free, we did give people the chance to donate towards the running costs – thank you if you dropped some coins in the pot, we got most of what we need to cover a future event! If you missed out, don’t worry, we’re doing it all again on the morning of Saturday 19 Jan 2013! Put it in your diary now! and ask to be put on the mailing list, or like our Facebook page. 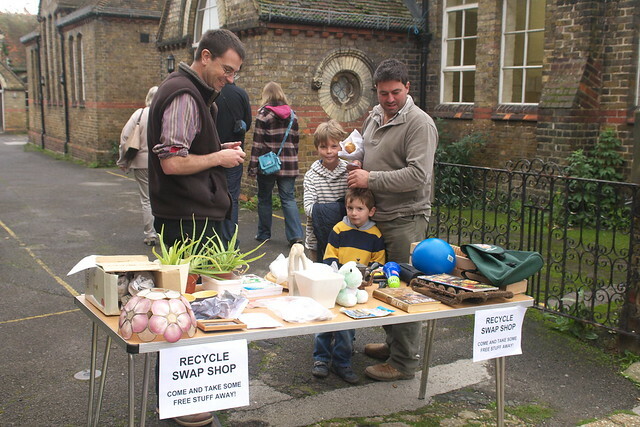 Recycle Swap Shop is an event run by St Mary’s Ecology and Transition Rye to provide an alternative for local people who would prefer to recycle such unwanted items to others in the community, rather than throw them away. We all end up with a chance to meet other local families for a Saturday morning chat, and we put less rubbish in land-fill, saving both the environment and tax-payers money. If you have bulky items, like bikes or furniture, then please don’t bring these to the swap shop. Instead, a notice board will be provided for you to leave a description of your item along with a contact email address or phone number. No rubbish. Please don’t bring anything that really is no good to anyone. 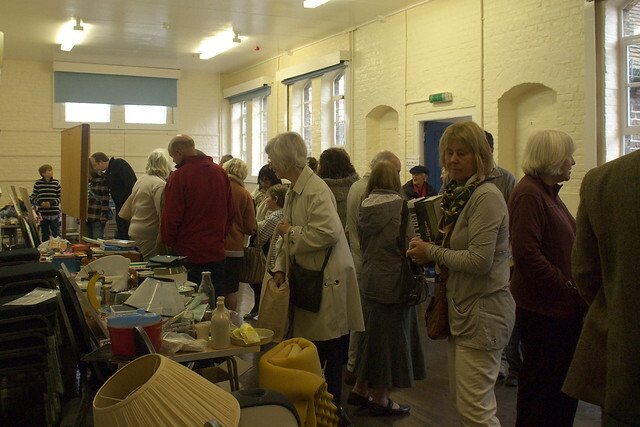 The Swap Shop is run a small group of local people who volunteer their time to organise these events and we don’t want to end up with a whole room full of rubbish to take to the dump! Note – St Mary’s Centre is what used to be the FE Centre on Lion Street. If you missed the last two Green Drinks evenings, do not despair – there’s one a month for the rest of the year! 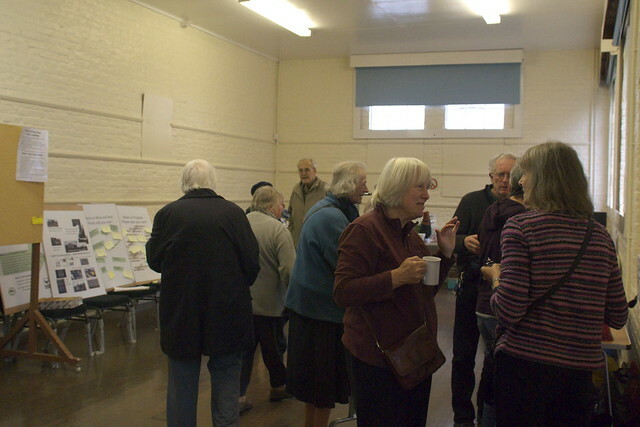 They’ve been great events so far, with 10-15 people turning up to have a beer or two and chat about the latest topics in Rye, with a vague focus on things affecting the environment, local economy, etc. Mostly just catching up, making new friends and having a fun evening though! Here’s the dates, all at the Queen’s Head pub near the Landgate in Rye. Next Green Drinks – 7:30pm 20th Aug! The Green Drinks last week was a great success, with lots of people coming to the pub specifically for it, and several others who were there by chance joining in too! We didn’t sit in a circle having serious discussions, people just mingled and drank beer, and chatted about whatever came up – some of it ‘green’ issues, but not all of it by any means. Several new things came out of the evening – one of our number’s booked to go on the Transition Network conference, we think we have a venue for a ‘swap shop’ in the autumn, and there’s at least one person booking onto a permaculture course in Kent too. So, we’re going to make this a monthly event – come and join us again for an informal evening of beer and chatting about issues affecting Rye’s environment and economy. Venue: The Queens Head pub, just down the hill from the Landgate in Rye. If you’re into ‘green’ issues, and how they affect Rye and the surrounding area, then come and join us for Green Drinks. It’s completely informal, just a bunch of people getting together to chat, come up with ideas and drink beer! We have all got used to the way energy is now available but the generally excellent service is a product of the last 120 years’ effort, a major part of which has been the installation of a superb distribution system for what we refer to as the utilities – gas, electricity, water, and communications. The first two, gas and electricity, are the energy utilities and, in the last 40 years, there have been major developments in the installation of a national and (later) international natural gas grid as the gas industry changed over from locally produced (and poisonous) towns gas to natural gas. At the beginning of the 20th century all energy production was indeed local, Mr Edison’s marvellous invention of electrical power being implemented by small and locally sited power stations for each town – country districts being gradually joined in over the next 40 years and a national grid being slowly built up. Where do we get energy now? The main sources are natural gas and electricity, supplemented at present by marginal supplies from heating oil, bottled gas and renewable resources such as wood and solar. These supplements are more important in the villages not covered by the natural gas network. Wind energy also provides a significant and increasing resource as we are reminded every time in Rye that we look out to the south east and see the mechanical ballet of the wind turbines. I’ll refer to the main sources as conventional and describe them first, going on to the renewable resources later. Our natural gas comes for the most part from the North Sea and, as this resource is gradually exhausted, increasingly from Russia and the Middle East. The build-up of the natural gas supply over the last 35 years was an extraordinary effort and indeed was a major source of the increasing economic wellbeing of the country after the oil shocks and coal strikes of the 70’s and early 80’s. The big reserves near to our shores in the North Sea and in Morecambe Bay are now running down and large interconnector pipelines from Norway and from Norfolk to Zeebrugge are bringing in increasing amounts of natural gas. Indeed, the Norfolk-Zeebrugge 42 inch 100 bar pipeline can supply the whole UK gas demand on its own – if there are supplies available from Europe – and that increasingly means Russia, Azerbaijan and Iran. These gas supplies are supplemented also by liquefied natural gas (LNG) shipments into terminals such as Kingsnorth in the Isle of Grain and Milford Haven. These come from much further afield such as Qatar, Algeria and Trinidad, the LNG market operating in similar fashion to the crude oil market. LNG is transported and stored at about -160 degrees Centigrade in very expensive large tankers and storage tanks. There is a variation in demand day by day and season by season – the gas network deals with this by a combination of letting the grid pressure reduce during periods of high short term demand, abstracting gas from storage facilities – exhausted gas fields in the Southern North Sea mainly – increasing supplies from the main international interconnectors (if available) and rapid gasification of stored LNG. The gas storage is then replenished during periods of low demand. Note that the increasing international dependence for gas energy has a direct effect on our balance of payments as a nation and therefore our economic wellbeing. Gas is always thought of as a clean fuel – indeed it is – but burning it does add to our CO2 emissions – those emissions we are trying to reduce by 80% by 2050. Like many European countries we are fortunate in having a highly developed national grid, enabling varying power demand to be met without interruption. In the period from the 50’s to the 70’s the Central Electricity Generating Board (CEGB) did an amazing job of building a network of massive power stations situated near the coal fields for the most part and typically in capacities up to 2200 MW – indeed they built too many for the load at the time. These stations have lasted a very long time but many of them are near the end of their useful lives and are steadily being retired also to meet the Carbon Reduction Commitment and other directives on sulphur dioxide, nitrogen oxides and dust. Some of these stations will be converted to biomass but be run only as peak shaving operations in December, January and February to compensate for the intermittent nature of renewable sources. The biomass conversions (Tilbury is a good example) – burn waste straw for the most part but include materials like waste timber and broiler house chicken litter– typically done by mixing it with conventional coal or by itself. Other newer stations have been built to burn natural gas and these have been a major source of our success as a nation in reducing our carbon emissions so far – natural gas only emits about half of the CO2 that coal does for equal energy production. Some of the first generation gas plants are themselves reaching the end of their lives. A major national strategy over a long period has been to reduce our reliance on single sources of energy – those of us of a certain age remember vividly the effects of the miners’ strike in 1974 on top of the oil shocks of the previous year. Who knows, if Iran decides to precipitate something in the next 12 months we could face a similar situation – but the wind won’t stop blowing or the sun shining. This was the reason why there was so much emphasis in the 1970’s on the building of a fleet of nuclear power stations at enormous cost. France indeed went much further than we did; our proportion of nuclear generation is about 16% whereas in France it is 77%. Additionally we still have all the conventional technologies linked together by our distribution grids. If we can remove the CO2 from the coal and gas burning for instance then these technologies will have a long future. Carbon Capture and Storage (CCS) is being developed to address the problem but, as an old process engineer, the thought of dealing with the enormous volumes of low pressure exhaust gas and stripping out enough CO2 to judge it clean, strikes me as a long and expensive development task to do it economically. Don’t expect much action for another 10-15 years. The rapid rise in wind and solar investment worldwide has stimulated very rapid technical development to the extent that prices for solar modules have declined by 50% in 2011 alone. The nature of solar technology is that it can be installed locally at an economic cost – there is little cost benefit in large scale installations as has been historically true of almost all other power generation technologies. This is a key factor in looking at the possibilities for the district round Rye and opens up the opportunity for a community energy project to serve local needs. Our area is one of the sunniest in the UK – remember the good-natured spat between Hastings and Eastbourne as to which is the sunniest resort. Solar energy is about 1000 Kwh per square metre per year and solar PV (photo-voltaic) panels currently have an efficiency of about 8-9% – about 90 Kwh/m2/year. If solar PV energy were the only source of energy we would need 1,000,000 square metres of panels, a square kilometre! Remember though that most of our energy demand is for space heating – and solar thermal panels heating water are a lot more efficient than solar electric panels – about 50-60%. Hence the popularity of solar panels to supplement your hot water supply. We’ve got a long way to catch up – Germany has already installed the same solar capacity that we are planning nationally for the year 2025 and Italy, for all its economic woes, last year invested 4 times as much as we did on solar generation. The rate of increase is indeed very steep and, even with the recent Government brake on Feed In Tariffs, it will still be both profitable and attractive. Wind turbine generators, on the other hand, do benefit from being of a certain scale – the justification for the Little Cheyne installation. This has an annual capacity of 165 GWh (a GWh – gigawatt hour – is a million KWh). 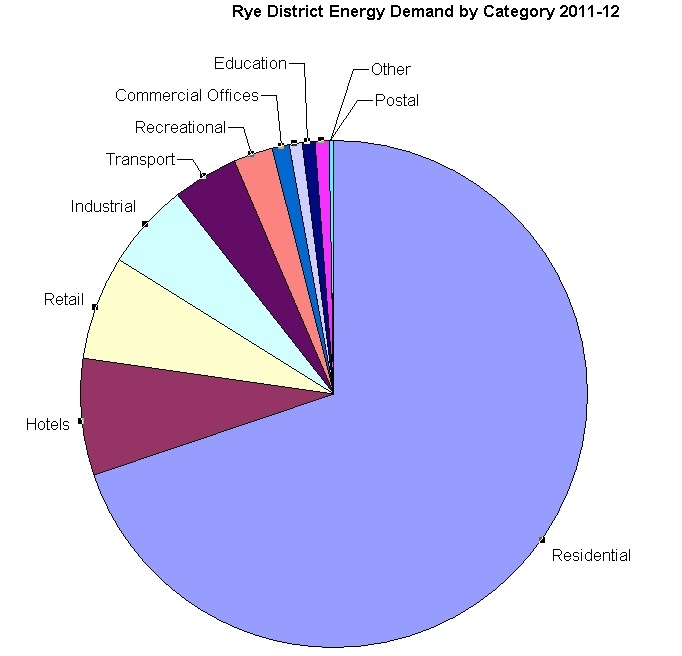 It is a sobering thought that the annual demand for energy (gas and electricity) for Rye and the surrounding villages is about half that – when you see the turbines in operation about 50% of them are serving Rye and district alone. Compare that also with Dungeness which, when at full capacity, generates 25 times as much as Little Cheyne. It is difficult therefore to see the roofs of the area sprouting large numbers of small wind turbines – they are noisy close-up – but when have you ever heard the noise from Little Cheyne? However, I think we will see more wind projects in future in the area and why should the community not take part as an investment partner in them – after all we have to look at them so we might as well profit from them. 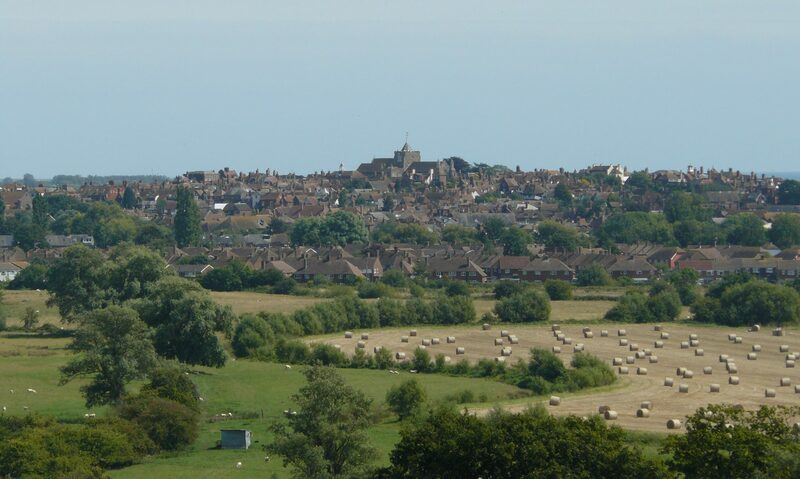 The district around Rye is a good growing area – Romney Marsh has had sheep for ever. The area has lots of water and solar energy – and biomass is the product. Wooded coppices have been a feature for hundreds of years, producing large amounts of charcoal up to the 19th century and supporting iron foundries as a result. Biomass represents stored solar energy, unfortunately a fairly inefficient process with only 1% of the incident energy being made available. On the other hand it is comparatively low cost to harvest if the land is not otherwise usable for agriculture. Are there some possibilities here? The big drawback to renewable wind and sun is that they are intermittent – the sun can go behind a cloud and the wind can drop quite suddenly – and a baseload backup must be there at all times to compensate for this because, with a few exceptions, electricity cannot be stored. Our biggest demand is always a winter evening in the middle of December and a large cold anticyclone over the UK so there is no wind – you still need to keep the lights on. We cannot be independent of the national grids for a long time yet. I hope to explore these problems and other required technologies a bit further in a later blog. Our future energy needs can be met by a mix of technologies and sources – from the distribution grids and increasingly from local sources – because they can made available at economically competitive rates – and the community can profit from the enterprise giving us both an income stream and making us less dependent on national and international events. It’s an exciting prospect that I hope we can explore through the Transition Towns Initiative. How much Energy do we use and who uses it? If we’re going to plan our future energy needs a good point to start with is how much do we currently use. More information on this is being made available and the the available sources are through the Office of National Statistics and, more recently (March 2012), the Department of Energy and Climate Change has published an amazing national heatmap where fairly detailed information is displayed both as tables and contoured graphic maps for every district. 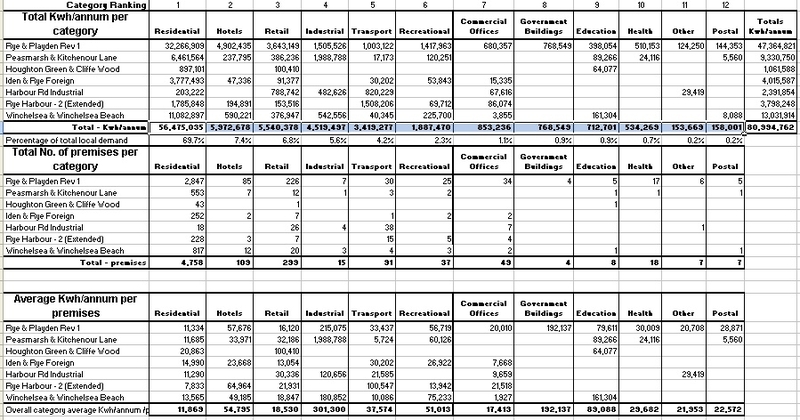 I’ve abstracted the data for both Rye and the surrounding villages and show it below, together with the links to the DECC website so you can make your own analyses. The website addresses are listed and should show you a map with the perimeter of each area delineated. As far as possible I have tried to minimise the agricultural land . They are all from the newly published National Heatmap produced by DECC, the Department of Energy and Climate Change. By any standard this is a remarkable work of data collation and presentation – but also see the comments below. If the links don’t work, try copying them into the command line of your browser. It has been quite a rapid process of assimilation to take in the detail of the heatmap and so I’m sure I’ve missed a few tricks along the way. I would very much appreciate comments on the data. So far I’ve not tracked down a decent description of the data sources which have been used to aggregate the data and I have noticed a significant difference between the figures presented here and those available from the Office of National Statistics website. These figures for domestic users are about 60% of those shown in the ONS listings (for 2009). I’m sure there is a consistent explanation for this but it has so far eluded me. There are some interesting data items – for instance who is the industrial user in the Peasmarsh area absorbing nearly 2000 Mwh per annum? (1 Mwh – Megawatthour – is 1000 Kwh). Each of the figures shown above could stand some detail data analysis, certainly when we come to look at how their energy could be generated in future. The data have a certain sort of inevitabilty to them in that Residential represents over 65% of the total demand. Although it’s not shown in these tables, the bulk of that demand is for space heating and therefore it highlights where the bulk of the effort should be concentrated – i.e. energy conservation – it’s the most cost-effective form of energy generation in one sense – hence the Government and industry’s big efforts to implement the Green Deal. About a year ago I attended an excellent series of lectures from David Martin of University College, London, an expert on local Vernacular Building, where he came up with an astonishing statistic. A property census was carried out for tax purposes about 1625 in the area and identified about 2600 buildings on the register. He has recently checked this register and has identified at least 1300 of them being still there either in whole or in part. This historic legacy is a major part of what makes this area so attractive both to live in and for visitors and tourists. We are still heating and ventilating these buildings and thus a major part of our effort locally must be to adapt and modernise this legacy in such a way that it becomes a both lot more energy efficient and preserves that heritage for future generations. I hope in further posts to review the available technologies for local energy generation, in effect a blue sky review of the possibilies, and then move on to some possible scenarios for community energy. All contributions of ideas and insights gratefully received. Rye as a Transition Town? So, what is a transition town and why should Rye be part of the initiative? 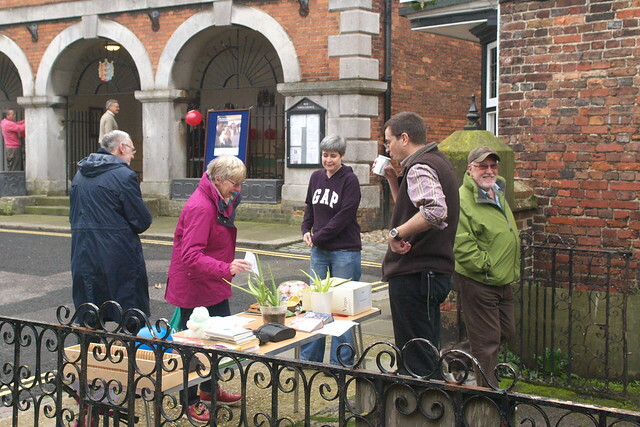 That is what this blog is about, a way of stimulating the discussion about the future of the town and what we, as residents, can do to improve it. It will succeed if you, the reader, take part in the discussion and help form the future of the town. Why should we be thinking more about the future of the town now rather than at any other time? Because large changes are under way – we have come to the end of an era and there is now no going back. Modern life depends on an abundant supply of energy and, to get that energy, we have been generating an awful lot of carbon dioxide – CO2 for short. Scientists keep telling us that the climate is changing and indeed our experience of weather during the last couple of years bears this out – excessively cold at the end of 2010 and much less rain – the reservoirs are less than half full this Spring. Something is definitely happening. At the same time the cost of that energy has shot up – in a very real sense the era of cheap energy is over and the evidence is all around, most immediately in the price of petrol at the pumps and the stubbornly high cost of electricity and gas. A shorthand for this is the price of crude oil and some of us remember when it was $3 a barrel – corrected for inflation that would be a current figure of $17 a barrel – currently it hovers between $90 and $100 a barrel, shooting up to a recent high of $147 a barrel. You’ll have to forgive the dollar and barrel shorthand – it’s the way the oil industry has always done it – see http://www.wtrg.com/prices.htm for an excellent analysis of the history of crude oil prices. These headline prices are reflected therefore in every other energy source price. These prices represent input costs on every endeavour in life – including running Rye. The added kicker is that the use of fossil fuel for energy is practically all we have known in the last 150 years and has been the underpinning of the extraordinary economic progress during that period – and, in a sense, why Rye has been able to keep its marvellous sense of history with a built environment and unique ethos – and high energy usage. The twin pressures of climate change and high energy prices therefore mean we have to change how we do things, at the same time preserve our heritage for both ourselves and generations to come. In a nutshell that is the challenge of Transition Rye. We have to plan for a different future. Purple prose it may be, but he expresses clearly the danger of inaction. There is indeed great fortune in taking the right course of action. How then, to select that course? The thesis is that we can improve our future by community action – more specifically by the community planning and investing in its energy future – community energy. Rye is particularly well suited for this approach. It is a comparatively self-contained and compact community in a large hinterland and surrounded by small villages. We are situated in a wonderful part of the country with excellent natural resources, water, wind and sun – we have one of the highest solar gains in the whole of the UK. We think we can establish a community-based energy enterprise owned in large part by the community with the objective of making us progressively more independent of imported energy, at the same time reducing the emissions of CO2 and making money for the community. Such a radical agenda will necessarily mean quite significant changes over the next 20 years in how we do things and modifications to the local environment. The government has set targets of a 50% reduction in emissions by 2020 and 80% by 2050.The changes to meet these targets can only come about by agreement – they cannot be imposed since we do not live under a dictatorship. It is hoped therefore in successive entries to this blog to establish some of the basic background – the size of the problem if you like – and invite you to comment and put up your ideas and solutions. It will be an interesting ride! We’ve only just set up this website, but check back in a few weeks to see what’s happening with Transition Town Rye.